2-story, 4 bedroom, 3 bath, Sleeps 8 comfortably. Spectacular ocean and beach front home located in an incredible rare location. Our vacation home has been completely remodeled from top to bottom. It is close to everything (town, shops, beach, boogie boarding, surfing, snorkeling, harbor, activities) yet private for your relaxing stay at your beach home-away-from-home. The home has been completely upgraded with all of the top of the line appliances and finishes. Custom flooring, decor, high end finishes, flat screen TVs, and custom live edge wood bar. Relaxing, private, and incredible views! : Our town home is located on the ocean side of the famous Ali'i Drive. Our home is so close to the ocean, you can toss a shell from the lanai and hit water. We have two three-sided lanais that offer incredible views of the ocean. The sound of the surf in front of the condo is so relaxing and if you look, you can see fish in the waves! There are dolphins and many other sea creatures (human too) that pass by daily. We have a special little known beach just a few hundred feet away that honu visit through out the day. Our home is ideal for couples or families. You cannot beat this view from three-sided lanais. The fourth side of the lanais are all glass sliding doors so that you can also enjoy the same ocean view from the inside! You will enjoy spectacular sunsets every night year round. During the peak season, whales swim and often breach right in front of the condo which is fun to watch from the lanais. You will also see dolphins year round. We are close to all you could ever want to do in Kona! Close by is a small private cove with a sandy beach that is kid friendly, shallow and protected. Turtles live there and they are very friendly and love to come swim up to you!! They are protected so please do not touch! One of the most incredible snorkeling spots on the Big Island is about a mile or so away with easy access for all ages and snorkeling levels. It is actually known throughout the world for one of the best snorkeling and diving spots that can be found. Our condo is located close to everything you need: downtown Kailua-Kona shops and restaurants, snorkeling, surfing, diving, boating, tons of water fun activities, golf, sandy beaches...you name it! Enjoy exploring any part of the Big Island and still be able to go home afterwards to the place where the Ancient Royals knew where to go to truly vacation. There is a reason they chose Kona. There is a reason we chose our home. Both are magical and unique locations that are difficult to find. We love our guests to share what we have found too! Great times with family and friends in a wonderful place creating special memories that last a lifetime. Our home is located in a very small complex of owners that all know each other well. We take pride in our home, and hope you have a wonderful experience there as well. Reunions, weddings, and family time are the best times spent here. Our unique location is perfect and large enough to get together with family, friends, or to celebrate special occasions. Our location also offers a wonderful place to take unforgettable photos together. Photographers actually bring people to our beach for their photo shoots. toilet, shower, Located in downstairs second master bedroom. All three bathrooms have been completely updated, with all new flooring, countertops, sinks, toilets, and tile. We have a special beach that only you will know about because you stay in our home! Perfect little secret spot where the honus come and go all day long to find refuge. The shade trees are a luxury. Close enough to downtown Kona to walk or drive, about a mile and a half, yet far enough away to be away from it all. About 2 miles from downtown Kailua-Kona Village. Great restaurants, shops, and live music just minutes away. Our local Turtle Cove is the perfect little known beach with shade trees, quiet spots, & the perfect place to spend a moment or whole day. Hang out in calm waters in a protected cove. Our custom town home is directly waterfront. The sandy beach is protected by lava rock with a small inlet to splash in and get your toes wet - Just enough to cool off away from any surf. Our ocean view is 180 degrees from the lanais and beach. We have an incredible amount of ocean activity mixed in with privacy all at your own home away from home. Complete oceanfront location and view. 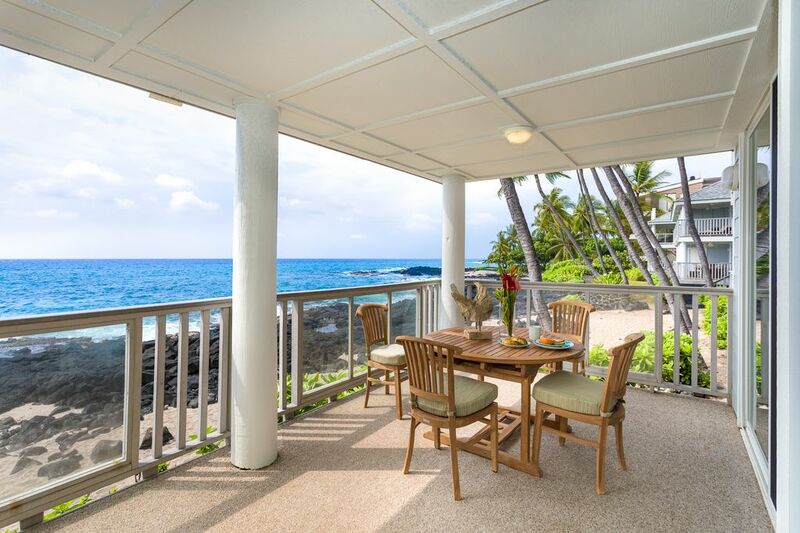 Upstairs and downstairs lanai have full open three-sided beautiful Pacific Ocean views. We have unlimited air conditioning. However, we ask for guests to respect that luxury. WiFi on the lanais and throughout the house. Plenty of room to be together in the living room. But the lanais are the favorite place to hang out most of the time. New Bosch Side to Side stainless steel with ice cube maker. Cuisinart four slice toaster for the crowd that cannot wait for more. Limited food items due to the amount of time guests stay. There are spices, salt/pepper, & other cabinet items that are slow to expire. New dishes, & glassware. Fully stocked kitchen with all of the necessities. The kitchen has been completely upgraded with Bosch stainless steel appliances, granite countertops, custom tile, and a beautiful bar area. Everything you need for cooking is at your fingertips. Lanais allow for 8 guests to sit and eat. There is a six seat patio table downstairs along with a comfortable bench to lounge on. Upstairs are two chaise lounges and a bistro table for two. New 60" Flat screen TV available in the downstairs living room and a 40" in the master bedroom. Free Time-Warner / Spectrum Cable. New Bluetooth speaker in living area. Big Island travel books, and so much more. Games, cards, puzzles, books located in the family room chest. Lawn area adjacent to our unit. Upper and lower Lanai for watching the sunset. Two huge lanai for watching whales, turtles and dolphins. Two huge lanai for watching whales and turtles and dolphins. Boogie Boards, noodles, and various gear left by guests available. Our home is great for family reunions, family vacations, wedding groups, small retreats, friend getaways, & special celebrations. Truly, it is a special place the young & young at heart can enjoy - from babies to seniors. We love to help our guests with suggestions on activities, dining, and anything else that we have experienced in the last ten years owning this home. We love to help our guests plan their time to make it easier if they need it. This is not an extra cost & we are not given any commission - just our tried & true experiences from our family to yours - and from guests suggestions. You will likely have dolphin sitings & honu (sea turtles). Whales breach right out front when they are traveling to Baja. There are also lots of other fun creatures to be seen in our ocean front yard. We have stayed in this small complex for many years. It is heaven on earth. And this unit is beautiful and just remodeled. You can watch the dolphins and whales from the lanai and fall asleep listening to the surf. And the owners are very helpful and have great suggestions. We had a spectacular trip. Had a wonderful week staying here. One morning we sat on the lanai and watched a pod of dolphins that were in the water right in front of the unit. What a great way to start the day! The unit was very clean and offered a lot of little extras from plenty of beach towels, beach toys for the little ones, along with boogie boards, water shoes, goggles, etc., along with cooler, umbrellas, etc., to take to the beach. Kitchen was well stocked with dishes, pans, bowls, etc. We look forward to coming back and staying here again. Thank you so much for taking the time to write a review. I am so glad you got to see dolphins right out front of our condo. Maybe next time you might spot some whales as well. Thank you again for choosing our home. You were a joy to work with. Please come back again. The views of the ocean were fantastic! The home was spacious and well decorated. The location was perfect and neighbors were friendly and helpful. Beautiful condo best Lanai and view on the island! This condo was perfect for our group of six. The bedrooms were spacious, comfortable beds, lovely linens and we each had our own bathroom. The master suite is spectacular! We loved hearing the ocean as we fell asleep. A very well appointed kitchen, with all the amentities and new appliances. Clean and modern, it had everything we needed for all of our meal needs. We spent hours on the lovely lanai which is right on the beach, watching the spectacular sunsets while enjoying our dinners at the large outdoor table was our highlight. Movie nights in the comfy living room furniture were a good way to unwind. Excellent location. Riders left each morn to get on their rides easily and quickly as the runners loved the scenery along Ali’i Drive. Walked to the market and poke shop for lunch. So close to to shops, restaurants and all amenities. Enass was a pleasure to rent from, excellent communication at all times. Thank you so much for taking the time to write such a wonderful review. We definitely have one of the best locations on the Island. The views are spectacular and the condo location is close to everything. I am happy to hear that all members of your party enjoyed all the island has to offer including cycling and other outdoor activities. Have a safe trip home and come back soon! This unit exceeded my expectations. The views are beautiful. It like being on a ship, but without the motion sickness. LOL! That’s so true! Good thing because I do get motion sickness. We do have amazing views. I’m so happy you and your family enjoyed our condo and our amazing island. Come back soon. I cannot say enough positive things about this home! The view from both lanais is fabulous for watching dolphins, whales, and the sunset. We stayed here with our three daughters and their husbands and there was plenty of space for everyone. Enass has snorkel gear, boogie boards, towels, and chairs for her guests to use (and now there is a fishing pole added, as one of our son-in-law fishes, but we didn't have room to take it back with us). There are also games and books. We all loved our time here and are sad to be leaving. Thank you for taking the time to write such a wonderful review. I’m so glad you enjoyed your time with your family. Hopefully you can come back soon! Happy New a Year! Our home is close to incredible snorkeling, surfing, boarding, beaches, golfing, & located on the ocean side of the famous Ali'i Drive a mile & half from downtown Kailua-Kona. Our home is so close to the ocean you can toss a shell from your three-sided lanais that offer full views & beautiful views and sounds of the grand Pacific Ocean and all its life has to offer. Plus you have your own sandy area to hang out on and a wonderful little known beach with turtles that come and go all day long - plus shade trees! Very unique property and part of the beach side of Ali'i Drive, Kailua-Kona. Other Activities: Parasailing, jet skiing, deep sea fishing, whale watching, shopping, restaurants, kayaking, hiking, lunch & dinner cruises. ****** Nightly Rate is based on a four-night minimum stay. Please inquire about single night stays, and stays less then 4 nights and Holiday/Ironman rates. ****** Stays under 4 nights, Holidays & Ironman are usually $549 - $695 per night. ****** Hawaii has a sales tax called "General Excise Tax" (GET) which is 4.438%, plus there is a "Transient Occupancy Tax" (TAT) of 10.25%, both of which are required to be charged on all rental nights. In addition, the Hawaii General Excise Tax of 4.438% must be charged on the cleaning fee. The Hawaii Tax ID for GET is GE-003-248-3328-01 and the Tax ID for TAT is TA-003-248-3328-01.